Tucked around a busy corner in the warehouse district of downtown Raleigh, N.C., is The Pit, a barbecue haven operated out of a restored meatpacking warehouse from the 1930s. 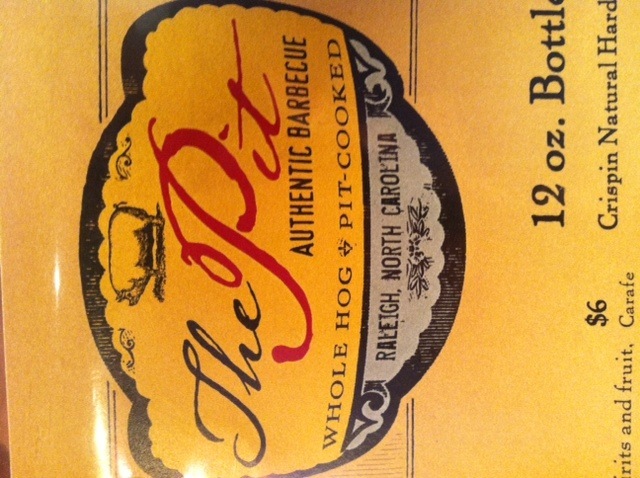 It’s been featured on multiple Food Network shows and remains known for its famous North Carolina barbecue. And yet, somehow, it maintains a vibe true to its locale. Visits still feel like invitations into a mystical inner circle. The food tastes like a secret. When I visited North Carolina last weekend, I got sucked back in. My girlfriend (who provided some of these pictures) and I made the 25-minute drive from Chapel Hill for a mid-afternoon lunch. The most celebrated item is a salute to North Carolinians – traditional Carolina Q, or vinegar-based pulled pork. Ed Mitchell, the pit master, oversees the production. A full hog – about 350 pounds – is split in half and set on a long rack inside a large black smoker. The skin faces up and is generously dusted with coarse salt, drying the skin and allowing it to cook golden and crispy. Hickory wood marinated in vinegar is added to the coals along with handfuls of oak wood. Mitchell shuts the grill, and 14 hours later he retrieves hundreds of pounds of pork, smoky and tangy, tender and moist. It’s pulled apart and chopped to serve. When the time is right, a pulled pork sandwich hits the perfect spot. But my girlfriend and I were both born with Western roots, so we opted for entrees with tomato-based sauces. 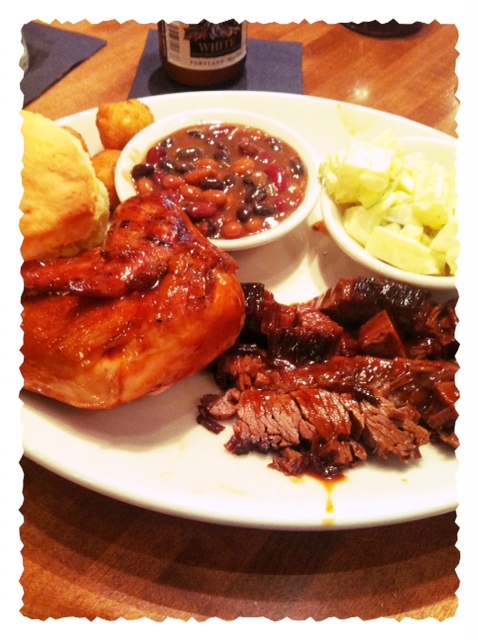 I ordered the lunch combo: barbecue chicken and brisket. It comes with a biscuit, hushpuppies and two sides. I chose baked beans and potato salad. The half-rack of baby-back ribs tempted me. Cooked for hours, eaten in minutes, the menu said. That was enough for my girlfriend to oblige. Our orders came, and a silence fell over the table. The brisket was sliced a half-inch thick, and smoke seemingly seeped from the meat with each bite. The sauce had a subtle richness and, best of all, there was just enough to complement the meat but not hide it. After finishing half of the brisket, I took a couple long gulps of Allagash White – a Belgian wheat beer from Maine, light and floral and perfect for the stickiness of an eastern summer. I cut into the chicken and peeled back the flesh, exposing the moist white meat. It was cooked perfectly, and as an admitted unconditional lover of BBQ chicken, I engulfed it. My girlfriend tried it and liked it, but she doesn’t have the BBQ bird bug quite like I do. She was busy chomping on the baby-back ribs, dividing the bones with her fork. The ribs were sublime. Moist enough to make your mouth water, tender enough to be savored, fatty enough to accentuate the richness of the meat. 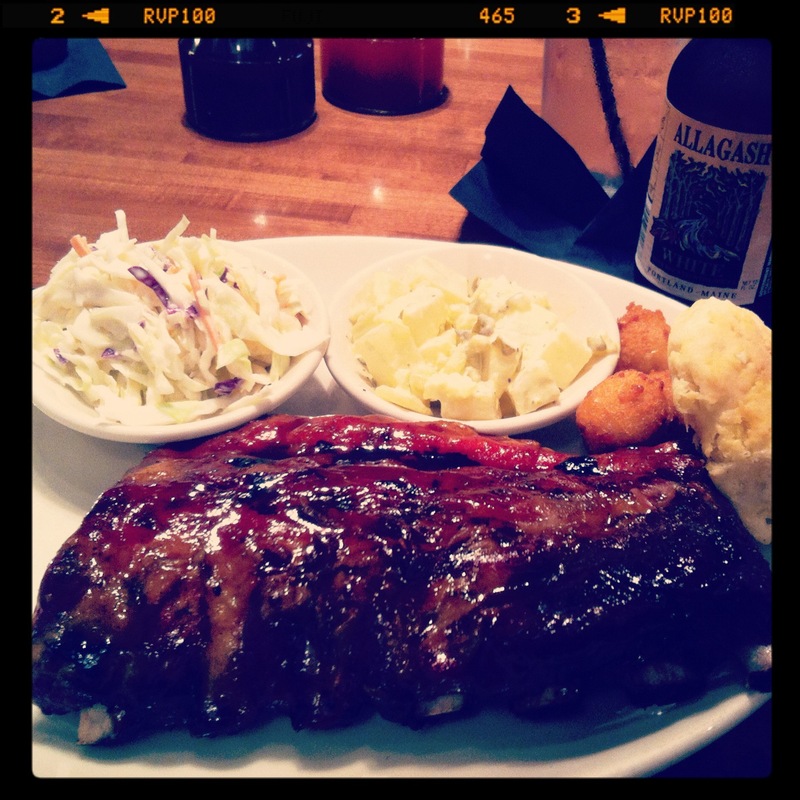 Perhaps most telling, the ribs quenched conversation. We leaned back, bellies full, and exhaled at our empty plates. I looked around the restaurant. A table full of church ladies dressed in all white sat across the way, chatting. A few afternoon lunchers sat at high-top tables in the open bar room, just off of the wooden rectangular counters where they serve cocktails from an expansive selection of booze. I felt fulfilled, a patron of Southern comfort food and good company, and thought about my next trip to The Pit. Our server, a pony-tailed man named Kevin, swooped by our table and laughed at my girlfriend’s stuffed expression. “Looks like you guys need two banana puddings,” he said. We groaned at the thought. Smoky maroon sauce still covered our fingertips.